This is a picture of which we can be sure that it is genuine. It was used in cinema showcases in 1988 and the very original I scanned is from the showcase of a German cinema. It makes me wonder if the scene might have been included in the version of the movie as it was presented in cinemas or if they deliberately used material from outcut scenes (they definitely did in some other cases, so I'm afraid the scene was not included in the cinema version). 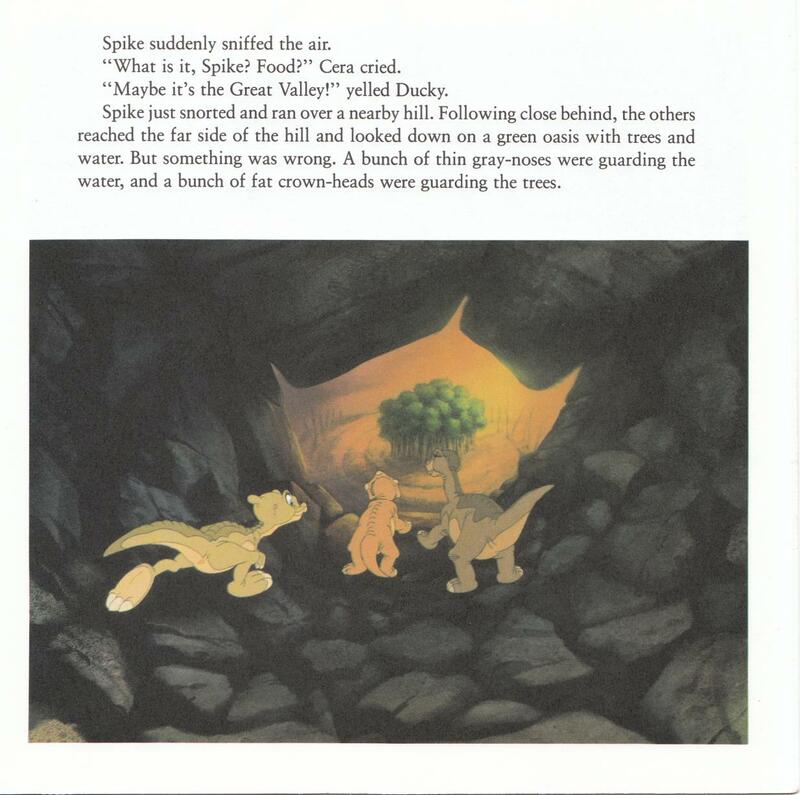 We can only guess about the content, but I suppose it is a fairly save guess if we assume that Ducky is trying to make Spike come along by luring him with those berries. We see her doing just that in the movie scene which would have followed this one (right after Spike's hatching) if it hadn't been cut out. One book suggests that there was opposition from Cera against taking Spike along. Whether or not this was part of the outcut scene we don't know. 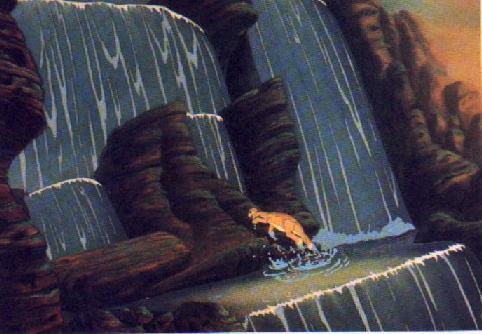 As for the content of this scene we can only guess with less obvious possibilities than in case of the previous picture. The four pictures above are all from the same scene. 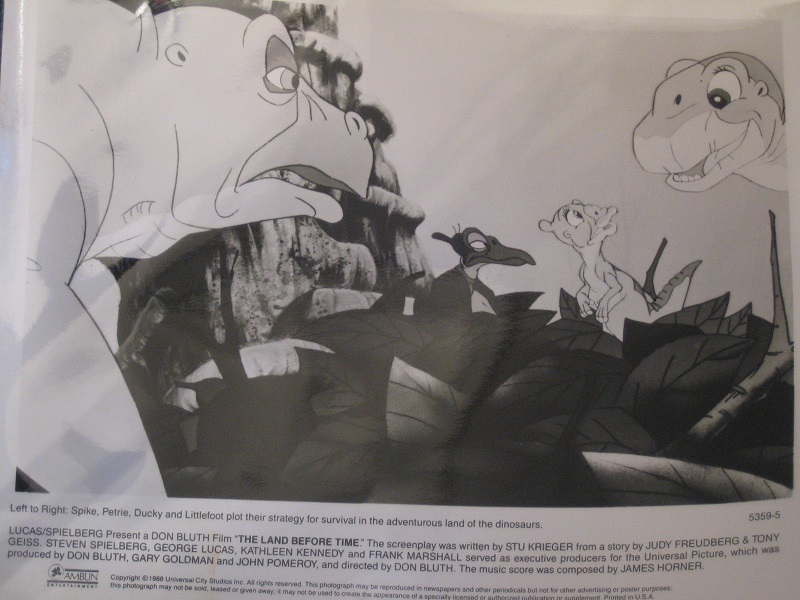 The first and the second are from the same press file as the previous picture, the third is a colored version of the second which was offered at ebay (signed by Gabriel Damon, the original movie's Littlefoot voice), and the fourth picture is from the book "Friend's in Need". We can be quite certain about the content of this scene. 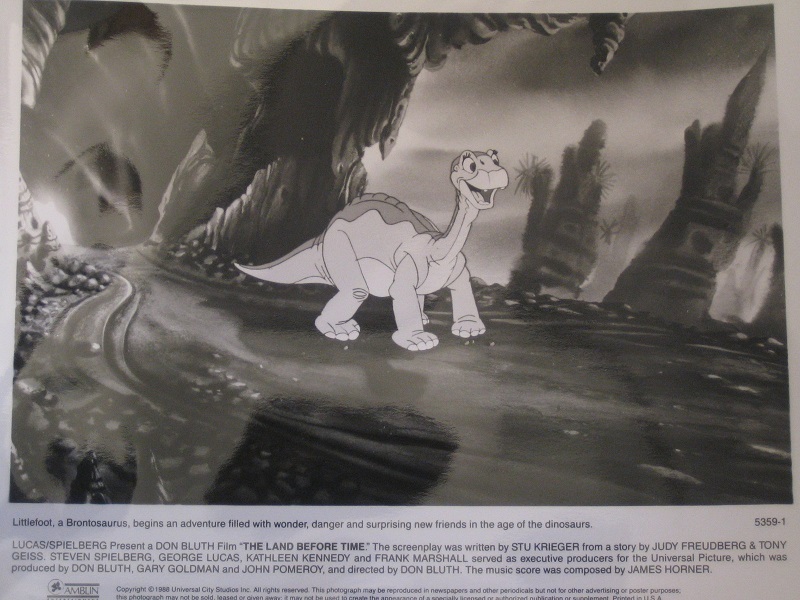 These are all pictures from Littlefoot's early discovery of the Great Valley right after the quarrel with Cera, which was later postponed until after the fight with the Sharptooth. 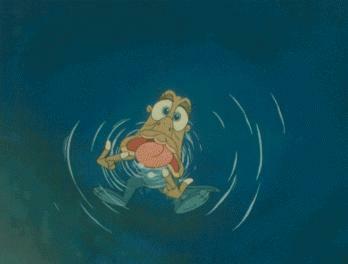 Apparently there was a scene of Ducky pulling faces at Sharptooth to provoke it into pursuing her. The terror in Ducky's face on the second picture suggests that it worked, but better than Ducky had hoped it would. I wonder why they cut out this scene. Presumably it was considered "too scary for kids". This is a really old topic from my first LBT website days when I was trying to work out the deleted scenes. 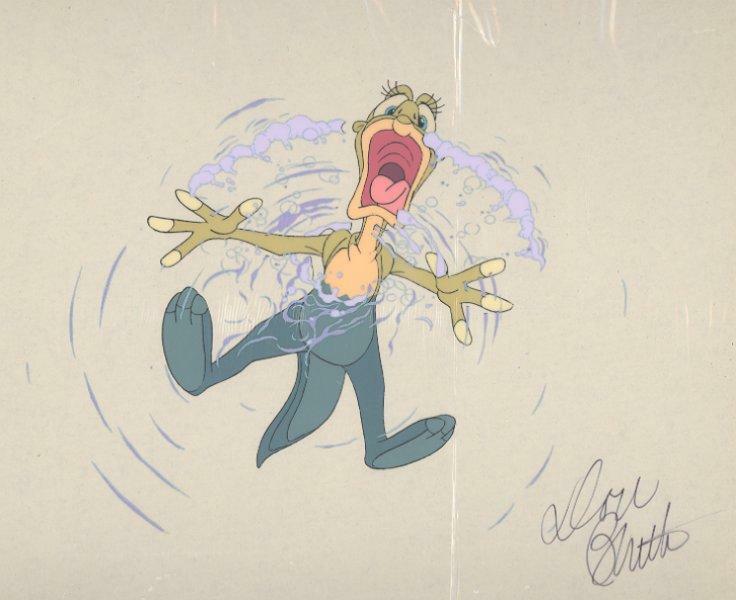 I think the "Ducky Scared" picture was drawn by Bluth for something else....not for the film specifically. I think it is a copy of an unfinished film cell signed by Bluth (who need not be the creator of that drawing). It is definitely not independent from the movie scene. The posture is exactly the same as in the trailer. I still think it would be better if at least the smaller pictures (excluding the one of sharptooth's death) could be displayed. Funnily I always get the response that dynamic webpages cannot be put into image Tags. It worked out just fine in other threads. But there something about that bit with Ducky, it was on a preview, a old one in the UK. 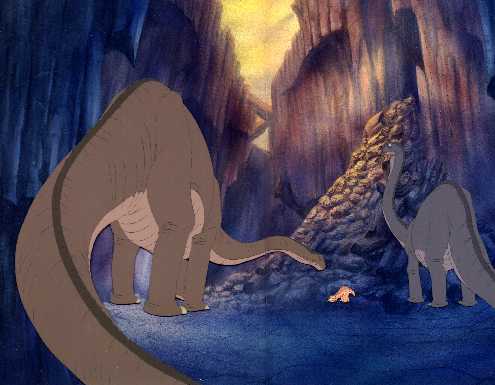 I got a video somewhere that shows about the first Land Before Time and show that short sence of Ducky pulling the face and being scared screaming as she swims for her life following the trying attack of Old Sharptooth. I think I recall this being spoken about before. Yes, that scene with Ducky pulling faces is indeed in a trailer shown not only in the UK. There must have been more though than what we saw in the trailer. 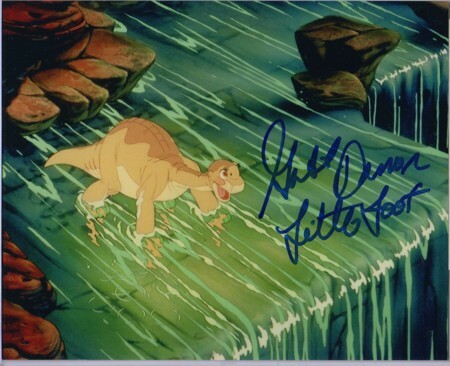 The scene must have included Ducky's getting at a supposedly save distance from the sharptooth after he spotted her. 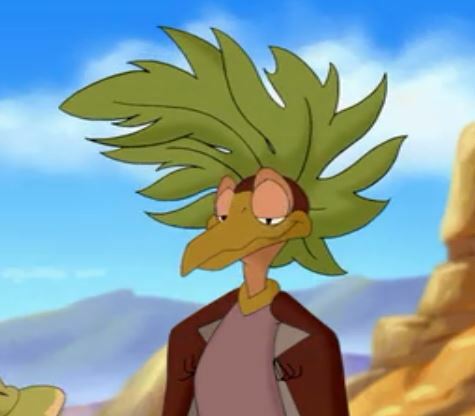 In the movie as we know it Ducky never gets enough leisure time and distance from sharptooth to even think about cutting faces. There is another picture from an outcut scene which I cannot show you, as it is only a slide. It is however a very unspectacular picture showing nothing but a very cloudy sky. My guess is that after the death of Littlefoot's mother the camera moved up to show just the thunderstorm sky (this is only a guess of mine, but the sky on that slide looks very much like the sky in the death of Littlefoot's mother scene), and that this camera shift upwards was cut for whatever reason. The reason your getting a dynamic page error is because you have spaces in your web address so %20 is automatically inserted to compensate for that. Take out the spaces, the images will work. Done that. Thanks a lot Adam! This is much better now. 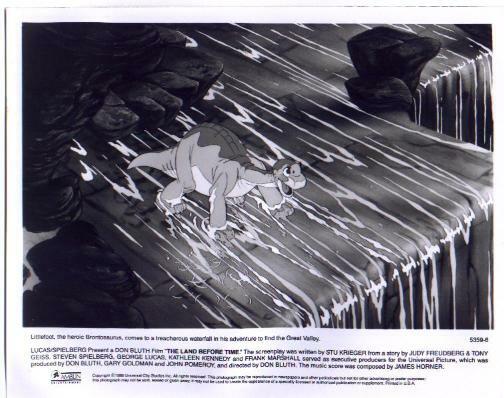 I left the Sharptooth death picture as an url as it would be so large. Some of the other pictures are rather large too, but I hope that the advantage of seeing them right away outweighs the disadvantage of the side being "broadened". If that's not so I will turn those images back into urls again. Yeah I knew that sharptooth one was huge...the others are ok I guess. Members can always right click on the image and "View Image" and it should resize it to fit in another browser window. I even got rid of the %20 that repersents spaces......I really want to see the Sharptooth's death!!!!! Malte will need to fix that. You can't take out the space on your own and expect the image to show because the space is there in the filename, but that space is what's causing the problem. My mistake. I had changed the name of a folder to avoid an empty space (which keeps making trouble if you try to directly link a picture). I forgot to updated the url of the Sharptooth image. It should work out now. As scenes were cut not only from the original movie, but are also regularly cut from the the sequels we could add material on these outcut scenes too (even though this thread is in the original movie's section). Unfortunately material on the deleted scenes from the sequels is even more sparcely settled as material on the deleted scenes from the original movie is. I'll do so as soon as I have the time to upload pictures. Don't expect anything spectacular though. Hey Malte, I've gone and took the pics that were too big for the screen and used Paint to shrink them. I think it would be far more convienent if you used them instead of the pics you have now, as it does get annoying to scroll left and right just to read your first message. Well, I've gotta go now. They don't look tiny to me. So, would you please use those two rather than the ones you have up now? I'm sure it'll automatically fix the text to an appropriate area and so that we don't have to continuously scroll left and right just to read your message. It is kind of annoying to have to do that, you know. As far as I know this isn't from the movie, as I found and scanned this pic off that "friends in need" book, its when the gang of five encountered a green oasis where two dinosaur species. The thin grey-noses who where guarding the water against the fat crown heads, who where guarding the food (trees, vegetation), and who didn't want to share with each other. So Cera and the others decided to move on to find their own food and water because the two dino species didn't want to share with them. I cannot see it either , can you please re uploaded it Flathead? thanks. 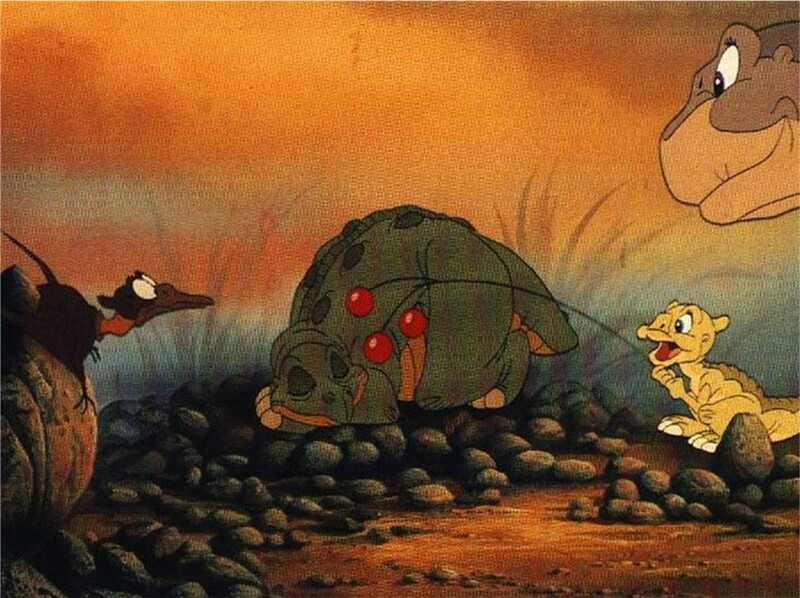 Cut scenes from the land before time 11?